Advanced Audio & Lighting Systems was called in by Oak Pointe Church in Novi, MI to evaluate the space and provide acoustic analysis and treatment that would eliminate room anomalies, a process which would eventually lead them to supplying a new audio design based on a Martin Audio Wavefront Precision Compact line array solution. Trent Keeling, senior design consultant for Advanced Audio, explained that the sanctuary “had significant acoustic issues and the PA system was lacking intelligibility, pattern control, and musicality. “Part of the upgrade was to architecturally emulate a high school auditorium, what we affectionately call a ‘praise-a-nasium’. The original stage was low with poor sightlines. 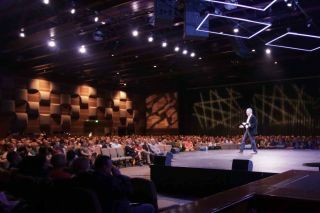 The church wanted to bring the stage experience closer to the audience, so they built a 30 x 40-foot circular thrust that comes out into the congregation with 130-degree seating around the stage." The system consists of six WPC enclosures a side flown just ahead of the thrust lined up with the downstage lip to avoid impacting sightlines for center, left and right video screens and stay out of the way during play productions. Power is provided by five Martin Audio iK42 amplifiers. “We used 2-box resolution [2 WPC enclosures per channel], with an eye to expanding to single box resolution with the spare iK42 that we have but it sounds so nice we haven’t made any changes,” said Trent. “All of which is why we greatly appreciate the small footprint of the Martin Audio WPC array. Also, the very flexible rigging that allowed us to easily optimize the system to the room without compromising performance. Asked why they chose Martin Audio WPC line arrays, Trent said, “one of the main criteria for the church was fidelity. We didn’t want a traditional crossover point in the high frequencies or a typical compression driver at 1.2 kHz because of the way it sounds to the audience. The church does marathon events and they wanted a system the operators and audience could listen to for two or three hours at a time without ear fatigue.